Want to see your mother’s face every time you unlock your door? You’re in luck. KeyMe, a service that lets people store digital copies of their keys and quickly replace lost ones, now offers customizable 3-D keys. If you’ve scanned a key using KeyMe’s iPhone app, you can mail-order plastic, brass or gold keys and personalize their handles with special designs, including popular symbols and shapes. 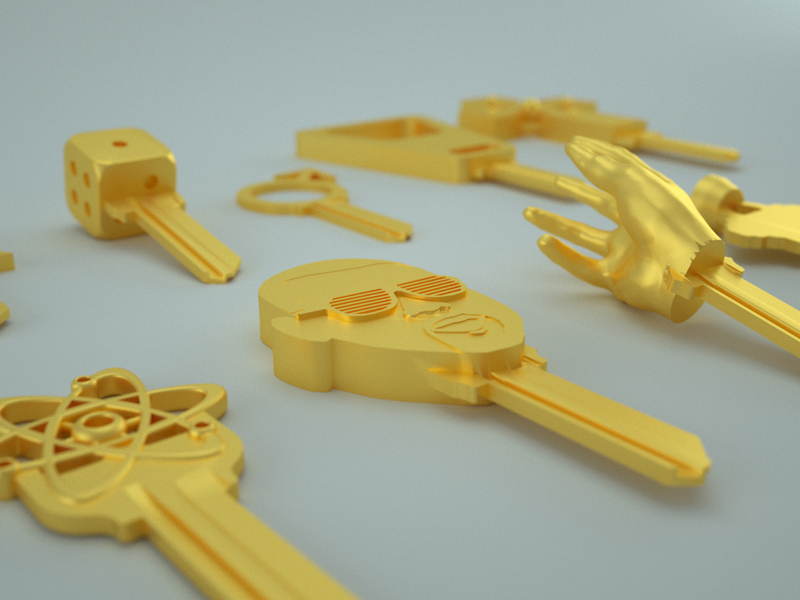 Prices range from $10 for the most basic plastic key to $4,000 for a golden key. You can also create original designs for the keys. Submit a mug shot of someone — your mom, for instance — and 3-D marketplace Shapeways, KeyMe’s partner in the initiative, will print a 3-D model of that person’s face onto your key handle. Users may also store a digital copy of a key that they may print themselves with any 3-D printer, “enabling people to fabricate their own keys for the first time,” according to Marsh. KeyMe’s smartphone app lets you scan digital copies of keys, so that you can obtain new ones without paying a locksmith to break your lock, or more easily manage or share them. Drawing on a user’s key scan, the app generates instructions that locksmiths can follow to create a physical copy of a key. Basic brass keys ordered through KeyMe’s app or printed at one of its special kiosks cost $2.99 each. Marsh said tens of thousands of people have storied digital copies of their keys on KeyMe, and that it’s printed about 10,000 keys for users so far. The company is one of Real Estate Connect’s “New Kids on the Block,” a group of disruptive startups in the real estate tech space that will be featured at the event. 3-D key printing is not the only service that KeyMe provides to complement its core scanning and cloud-storage technology. In Manhattan, it operates special kiosks in 7-Eleven and Bed Bath & Beyond stores that people may use to print new keys themselves, using either a digital or physical copy of a key. The company also lets New Yorkers who have scanned their keys with the app obtain new keys in less than an hour through a special delivery service that it rolled out in partnership with locksmiths in November. KeyMe closed a seed funding round of $2.3 million in January that was led by Battery Ventures, Marsh said. Coinstar founder Jens Molbak and Virgin Mobile founder Amol Sarva are also investors in the company, he added. In 2014, Marsh said KeyMe intends to “aggressively increase” its kiosk footprint in New York City and other major cities.